Build mobile apps efficiently with Kivy, the Python-powered graphical toolkit for creating natural user interfaces with elegant multitouch support. 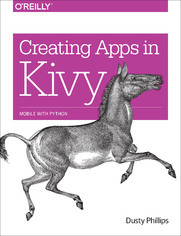 With this hands-on guide, you&#8217;ll learn step-by-step how to build and deploy a complete Kivy app for iOS and Android devices. If you&#8217;re just beginning to work with Python, but are reasonably familiar with its syntax, you&#8217;re ready to go. Each chapter includes exercises, using examples that run on Python 3 and Python 2.7. Learn how Kivy simplifies mobile development with its cross-platform API and domain-specific Kv language, and why this free and open source toolkit is ideal for commercial products.